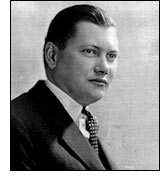 Ralph Peer was among the most important A&R directors of the 1920s and 1930s, first for Okeh and then for Victor. Below, he recalls his discovery of Jimmie Rodgers. When I was alone with Jimmie in our recording studio (a very old warehouse which had not been in use for many years), I was elated when I heard him perform. It seemed to me that he had his own personal and peculiar style, and I thought that his yodel alone might spell success. Very definitely he was worth a trial. We ran into a snag almost immediately because, in order to earn a living in Asheville, he was singing mostly songs originated by New York publishersthe current hits. Actually, he had only one song of his own, "Soldier's Sweetheart," written several years before. When I told Jimmie what I needed to put him over as a recording artist, his perennial optimism bubbled over. If I would give him a week he could have a dozen songs ready for recording. I let him record his own song, and as a coupling his unique version of "Rock All Our Babies to Sleep." This, I thought, would be a very good coupling, as "Soldier's Sweetheart" was a straight ballad and the other side gave him a chance to display his ability as a yodeler. In spite of the lack of original repertoire, I considered Rodgers to be one of my best bets. He was quite ill at the time, and decided that instead of trying to return to Asheville he would visit a relative in Washington, D.C. The money was enough to pay for this trip. A few weeks later, when I heard the test recordings made in Bristol, it was apparent that Jimmie Rodgers was tops as a yodeling singer, and I arranged to have his record issued quickly. The dealers ordered heavily and then reordered. It was obvious that Jimmie Rodgers was the best artist uncovered by the Bristol expedition. I had already written Jimmie about getting more new material ready, but had received no reply. Consequently, I located him by telephone and was pleased to have his assurance that he had a wealth of new songs. I arranged a recording date at the Victor studios in Camden. Jimmie and I met for the second time when he stepped off the train in Philadelphia. We worked hard far into the night getting enough material in shape for the first recording session. Actually, we did not have enough material, and I decided to use some of his blues songs to "fill in." When we recorded the first blues I had to supply a title, and the name "Blue Yodel" came out. The other blue yodels made at the same time had titles suggested by the words, but when I witnessed the tremendous demand for the original, I decided to change these names to "Blue Yodel No. 2," "Blue Yodel No. 3," etc. From this time until his death he was able to lead a new life because of his income from recordings and copyright royalties. Unfortunately, he was generous to a fault, and when he received a large check he shared it with friends and relatives. The best doctors told him that he would not live because his tuberculosis was incurable. 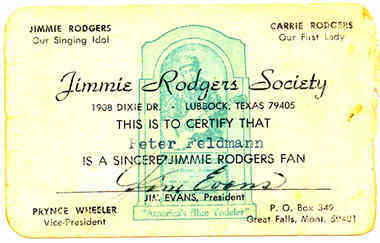 As a result of his fast-selling Victor records, Jimmie Rodgers quickly rose to the top as an entertainer. He began to earn good money working in night spots, traveling shows, etc., but his bad state of health was a great handicap. This man really had "guts." He was fired with a great ambition to be successful, both as an artist and financially. Eventually he headed his own traveling show. As a guitarist he was an individualist; that is, he had his own way of selecting his chords, and was what can best be described as a "natural" guitar player. I remember that another artist, during the year 1931, spent a great deal of time learning one of Jimmie's "wrong" chords. Whatever he used always sounded right, but upon examination it was quite often not the chord which would ordinarily have been used. This provided individuality for all records in which his guitar playing predominated amongst the accompaniment, but quite often it was a problem to find musicians and other artists able to fall into the spirit of his recording style. His recording of "Blue Yodel" skyrocketed Jimmie to fame in the amusement business. The once-poor Mississippi brakeman became the idol of the southern and western States. His fame developed through his record fans. Broadcasting stations were then comparatively infrequent, and only the radio chains had sufficient power to create nationwide propaganda. They adhered closely to a policy of using live artists, and almost invariably artists popular in the New York and Chicago areas. Jimmie was practically unknown north of the Mason-Dixon Line, but within a year he became the most important recording artist in the region where hillbilly music has always enjoyed greatest popularity. If his health had permitted, Jimmie would have become a top name in the theatrical world, but routine work on the stage was bad for him. His copyright royalties began to pile up, and eventually Victor gave him a royalty contract on a basis similar to a grand opera star. In an effort to extend the Rodgers popularity to our Northern States, I booked him on the Radio-Keith-Orpheum Circuit. He was to appear as a single act in most of the leading vaudeville theaters. The salary, $1,000 weekly, was considered high at the time. Jimmie became ill, however, and we had to cancel the project. Rodgers liked working in "tent shows." He felt at home in the informal surroundings and greatly enjoyed his contacts with other performers. 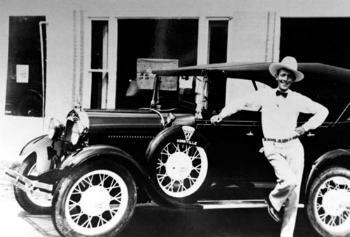 One of the highlights of his career was a tour through north Texas and Oklahoma as part of a charity Red Cross drive in which he was starred alongside of Will Rogers. They became fast friends. In the spring of 1933, Jimmie and I corresponded about the possibility of additional recordings. Victor had about a year's supply of material already on hand. The record business in general was not good, and they did not think it wise to be too far ahead of the market. Jimmie Rodgers by this time had become "standard." There were one or two masters to be remade because of technical defects. There was also the necessity to negotiate a new agreement between Victor and Rodgers. Working with all of these factors, I arranged matters so that Jimmie could come to New York for a series of recording work, and after the first two dates it seemed best to delay further activities. He died May 26, 1933, in his hotel bedroom. It became my painful duty to send him back home to Meridian, Miss., for burial. Today his distinctive style remains a goal for all new recording artists. Many of the compositions which he wrote wholly or in part have become perennial standards. His fame has spread to all countries of the English-speaking world. The impetus which he gave to so-called hillbilly music, in my opinion, set in motion the factors which resulted in making this sector of the amusement business into a matter of world-wide importance and a source for a high percentage of our popular hits.